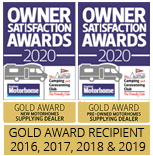 Please use our stock search facility below to identify our range of motorhomes that suit your requirements. NOTE: The sections with square checkboxes allow you to select multiple options. This option is only available if 'Coachbuilt' is selected as the vehicle type. For all customers over the age of 70 or who passed their driving test after 1st January 1997 please ask for information regarding possible restrictions with motorhomes over 3500 kgs.